The Puffy Mattress is a hand-crafted mattress that has been designed using the latest technology and high-quality foam layers. It is ideal for all sorts of sleepers since it has a medium level of firmness and a sleeping surface that feels incredibly soft. The mattress is built out of body-adaptive materials that provide proper support for your spine and a special pressure-relieving formula to provide extraordinary comfort to the sleepers. In addition, Puffy features the brand new Cooling Cloud technology, making it one of the coolest sleeping mattresses sold online. Thanks to the body adapting cloud formula foam and the Cooling Cloud layer, the Puffy mattress was named the Internet’s most comfortable mattress for back and side sleepers. Home buying checklist readers get a special deal right now. Use the code “BESTPUFFY” at checkout and get $250 off of your mattress! The design of the Puffy mattress is deceptively simple. It is made out of only two layers of foam which provide ultimate comfort and wick away the heat. According to the manufacturer, Puffy will not only improve the quality of your sleep and increase your energy levels but it can also improve circulation and relieve joint pain. A mattress that relieves body’s pressure points the way that Puffy does will help you fall asleep faster and stay asleep longer. Puffy is a bed-in-a-box mattress that is manufactured in the United States. The manufacturer doesn’t use any toxic materials in the construction of the mattress but as many eco-friendly products as possible. Puffy is made out of two foam layers that form a 10-inch mattress. The base layer is 6 inches thick and it provides the necessary support and durability to the mattress. This layer also has a level of firmness that is necessary for proper spinal alignment and that provides comfort for sleepers of all sizes. The top layer is 4 inches thick and it is gel-infused visco polyurethane foam. 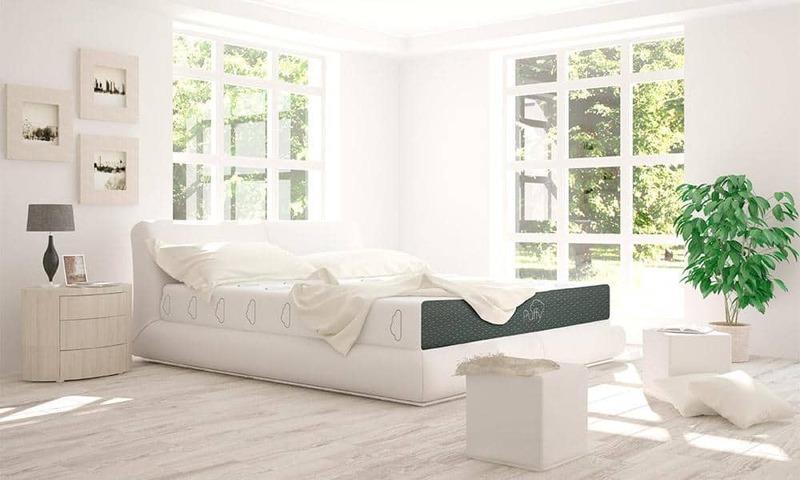 The purpose of this layer is to provide a soft and cool sleeping surface which is achieved by an incredible level of breathability which dissipates the heat away from the body. The firmness of the bed is medium; on the scale of 1 to 10, it falls between a 5 and 7, making it softer than the average mattress-in-a-box. Of course, the firmness of the mattress also depends on the weight of the sleeper. Those who weigh less than average will probably feel only the softness of the top layer without experiencing the firmer base layer. On the other hand, sleepers who weigh more than average will have more contact with the base layer making the entire mattress feel slightly firmer. The Puffy mattress was made out of materials that incorporate cooling technology. The top Layer features the Cooling Cloud Comfort Layer formula and it is infused with a gel that increases the airflow and breathability. The gel absorbs the heat from the sleeper’s body and helps in dissipating it. The bottom layer creates a solid base that won’t allow your body to sink, keeping it close to the surface. This prevents any unnecessary heat from building around the body. In addition, the cover of the mattress is also breathable and provides additional aid in keeping your body temperature neutral. One great thing about Puffy is that it was designed to work with almost every flat surface. The mattress is so durable and you can place it on a box spring, slatted frame, flat frame, or even an adjustable frame. You can even place this mattress on the floor as long as there are no wide spaces since they could compromise the structural integrity of the mattress. After ordering your Puffy mattress, you can expect it to appear on your doorstep within two to five days. The company provides free shipping via FED-EX to the contiguous 48 States and to most of the states in Canada. However, shipping to Hawaii and Alaska costs $150. In addition, the buyer will get a shipping number so he could track the delivery. All Puffy mattresses are squeezed into a small box sized 19″ x 19″ x 42″ to ensure easy and environment-friendly transfer. All you have to do is move the box into your bedroom and unroll the mattress. This makes moving into a new home incredibly simple – no need to coordinate with a mattress store and waiting all day for a delivery truck. Keep in mind that it might take a few hours for your mattress to expand fully after being in the box for some time. 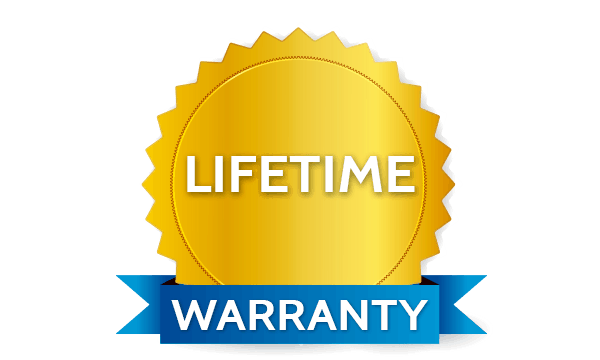 Puffy offers a limited lifetime warranty for the Puffy mattress and it covers any manufacturing defects you might face. In addition, Puffy offers a sleep trial which lasts for 101 nights from the date of delivery. If you are not satisfied with your mattress, the company will schedule a pickup (free of charge), refund your money, and donate the mattress to a local charity. Keep in mind before scheduling the return that it might take your body up to four weeks to get used to its new sleeping surface. Cloud cooling foam layer keeps you cool through the night. Body adapting cloud formula cradles your body and relieves pressure points. 101 Sleep trial makes it risk-free to try. The company offers a lifetime warranty for the mattress. Like most foam mattresses, the Puffy doesn’t have a strong edge support. There is only one model available when it comes to firmness. It can be on the softer side for those that link very firm mattresses. Like most online retailers, there’s no way to try the mattress prior to purchasing. But easy returns and a full refund help make things easier. Where Does Puffy Ship to? According to the company’s website, the Puffy mattress ships worldwide. But, it seems that for now deliveries are limited to the US and Canada. Is Puffy Available on Amazon? For now, the Puffy mattress is available only on the Puffy website. It is not sold by any online retailer and the company doesn’t have any brick-and-mortar locations. You can purchase your Puffy mattress here. The Puffy mattress is a great choice for all those who are looking to get all the benefits of a foam mattress but without overpaying. In addition, unlike the traditional foam mattresses, this one will stay cool and won’t cause the sleeper to feel like they are sinking into the mattress. Puffy is very sturdy and includes motion isolation which makes it suitable for all different types of sleepers. In addition, the mattress provides proper body support and is a great choice for all people who suffer from back pain or joint pain. There’s an added bonus. Puffy donates mattresses for children without beds through their Jump For Kids program. Buying a Puffy mattress helps support a wonderful list of charities focused on child homelessness, so you can sleep sound on you new mattress knowing you helped someone in need. 🤷‍♀️ Not sure if you've found the right mattress? Check out the rest of our reviews!